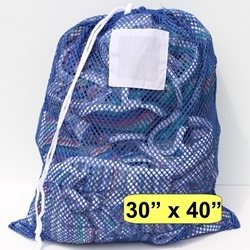 Laundry Bag Blue Mesh Net 30" x 40"
Mesh Bags 30" x 40" → Blue Mesh Net Draw String Laundry Bags 30" x 40"
Blue Mesh Net Draw String Laundry Bags 30" x 40"
This is our Blue Mesh Net Laundry Bag. It is made of a heavy weight polyester mesh. This bag is 30" x 40" and features a Drawstring & toggle rope closure. All of these laundry bags come standard with an ID Patch that is used to write a person's name on the bag. Do not exceed 158 Degrees Fahrenheit when drying. Imported.